Yesterday we revealed 6 Simple Steps to Totally Crush Your Shopify Sales. Today we cover 3 “Conversion Rate Boosters” for instant Shopify sales. By now we’ve accomplished a lot together. You bought a domain, designed your store and installed your theme – even created your first series of Facebook Ads to identify winning products. Conversion rate optimization means exactly that. We are doing whatever we (ethically) can to increase our conversion rate. For a Shopify store this means, more sales. Before we jump into it, I want to touch on something. That something is hard Work – Consistent, focused, hard work. This is the secret to success. There is no easy button to make everything magically happen. There will always be roadblocks, snags and unforeseen circumstances. Honestly, I deal with it daily. Not one single day goes by that I am not faced with some level of adversity when building or scaling one of my endeavors. Whether they be self imposed or acts of nature out of my control, the daily adversity only serves to make me a better person and even better entrepreneur. By flexing my resolve and doing what needs to be done to overcome and move beyond any task, I am showing the universe that I am ready for anything it throws my way. And with that perspective, anything thrown my way is ultimately positive. Take a look at any successful business person, online or otherwise. Or even Ritoban for that matter. He faces challenges every single day. His entire FSO business model is literally based around a “challenge.” A learning curve associated with each of the new businesses he builds from the ground up every 30 days. The point is, the Shopify business model, truly is an easy one to grasp, implement and scale when compared to other online ventures. Fortunately here at Flying Start Online we remove much of if not all of the learning curve associated with building successful online businesses. Take advantage of the lessons, resources and direction provided by our team and keep the good karma flowing by paying it forward once you too have become successful. Alrighty, enough preaching, let’s get to it! We have officially surpassed $2k in sales since our Shopify store went live just under two weeks ago. We’re currently seeing a 3% conversion rate, which isn’t terrible, but we are going to try and increase that with today’s post. If you’ve been following along and have already seen your Shopify store begin to see sales, we’d love to hear about it in the comments below. Conversion Rate Optimization (CRO) doesn’t mean spending more on the current ads just go try and get more overall sales. It means spending the same amount and making adjustments to get the most out of the current spend. When you use an exit intent popup like Privy with your Shopify store, users will be presented with a popup either confirming they want to leave and / or offering them a discount if they stay and purchase right now instead of abandoning the site. Click here to get Privy (FREE). Email will be automatically selected which is fine. Scroll just underneath this and you’ll see “Validations” which will already say, “Limit one signup per email address” and is totally fine. Just underneath this you’ll see “Add new email sync” now hover over it and select “Click to Create” and choose your associated Shopify store from the drop down menu then select your customer list. It will already be there because you connected your store upon downloading Privy. 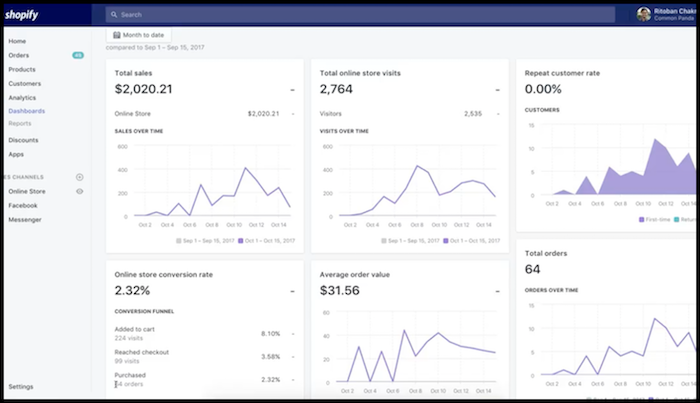 Now that you’ve created and saved your first campaign you’ll be returned that campaigns “dashboard” where you can now click “Design” from the menu. You’ll want to click “PopUp Triggers and set yours to “Exit Intent” only and save it. Just underneath triggers you’ll see tab design where you can fully customize the look and content of your exit popup. In the case of Common Panda (our Shopify Store) we are going to be offering a 10% discount incentive to encourage a purchase. Finally we are going to ensure the popup displays as a popup. 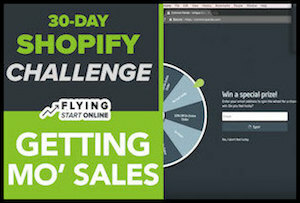 Spin-a-Sale is another type of popup, but this one is more interactive and doesn’t necessarily need to be implemented upon a users attempt to exit the site or sales page. The Spin-a-Sale overlay displays a special prize wheel for visitors that you can fully configure when visitors enter their email address, the prize wheel spins and they win a random discount. This app can be fully customized so you can specify the exact discounts you’d like to provide customers and how often each discount is provided. Spin-a-Sale offers a free version as well as paid versions. Here at FSO we went with the $9.99 monthly version since it was mobile and desktop compatible. You get a free 10 day trial, so why not see if it helps. If it brings up in even one sale per week, it will pay for itself several times over in the first month alone. Before you configure Spin-a-Sale to display your five random discounts, you’ll need to head back to Shopify and create them. From the next page, click “Create Discounts” and fill out the fields accordingly. We named ours “Spinner 10,” “Spinner 20,” etc. This way we can track which discounts / popups are converting best. Once you save your discounts spin popup, you’ll need to turn it on from the page you’re forwarded to. You’ve just installed one heck of a powerful conversion rate optimizer. This one may seem mundane, but I can assure it’s powerful, sneaky and often overlooked. Testing the purchase button and headline colors should be two of the first things you ever test with any e-commerce business, not just Shopify Stores. Click “Customize” on the top right of the following screen. From the next page, choose “General Settings” tab from the top left sidebar. Your products should now be displayed on the main screen. Choose any one. We are first going to change our button color from orange to green. Scroll to “Add To Cart Button Settings” and edit according to your own brand. That’s a wrap for Day 16 – Well done! P.P.S. Click here for Day 17!